I cut the alu pipe to length today. I don’t want to cut the motor cables so, to compensate for the extra length I printed this support. On the forum I saw somebody drilling a hole in the fuselage to mount a similar support. I did not feel so comfortable with that idea so I took a photo of the cross section of the fuselage and after a few prints I had a very tight fit, so it is can take some lateral loads in addition to the vertical loads. The prop is originally from @tunnelvision, THanks! I adjusted it so it will fit on the PM setup. The parametric duct by @pacificmeister & @Taylor is adjust to fit the prop. I beefed up the struts a bit and tilted them further back (I have this space available with this prop). All but 1 hole are drilled in the mast for the wires + water cooling. The mast clamp and seal mount are epoxied to ensure water tightness. 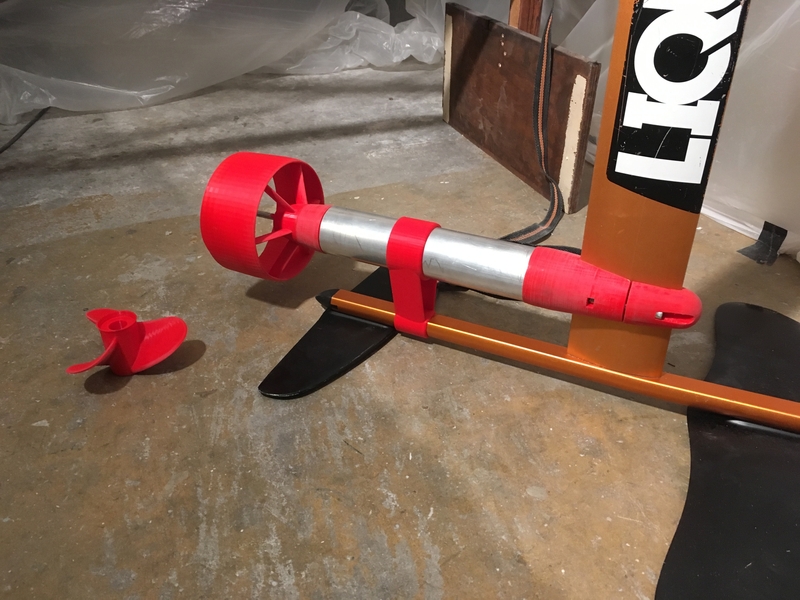 Do you guys recommend to epoxy the prop and duct as well? And how many layers do I have to apply, just 1? So next up is assembling the pod and pull the wires through. I am just waiting for a re-delivery of the shaft seals. The epoxy foam mould which I inserted the other day cured nicely, feels quite solid. I used the router to make 2 recesses for the fin boxes. Next time I will epoxy these in place. Do you guys have any tips/recommendations for this part?? Do I have to later place epoxy+glass over these boxes (except for the slot) as well, or should I work just directly around them? My biggest worry is the box hatch. Really hope it will be water tight. I started to assembly the (red) frame (made up of 8 parts, 4 corners + 4 straights). The corner sections and short straights are epoxied together and curing. Later they will make up 1 frame as per below, but fully coated with epoxy. Finally I will place, from the bottom up, the stainless steel inserts with thread, so I can secure the cover with 30 bolts. In between the frame and cover will are 2 strips of rubber, as a seal. 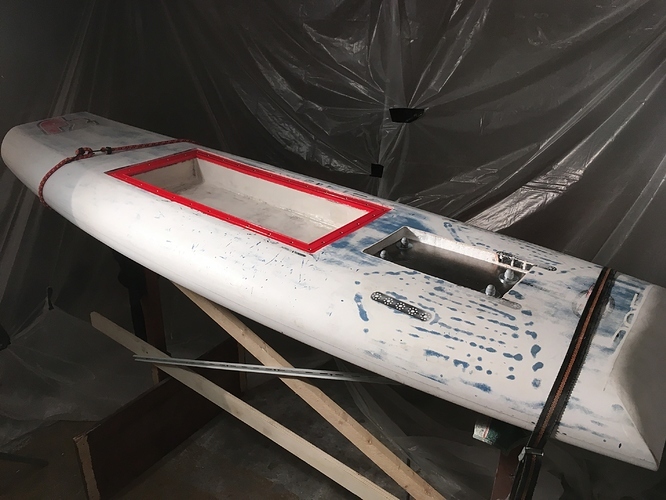 The big hole is where a 3d printed part (coated with epoxy) will be placed, to route the cables from the box to the mast. I prepared the e-box first with a layer of epoxy+wood fibres and later with another thin layer of epoxy+filler to make it level. Next, after sanding it smooth, will be a layer of glass. The shallow recess is where a metal counter plate will be placed to give additional strength to the mast connection (see sketch further above). Looks great. You’ll be surprised how well your hatch seals. Are you using marine plywood for the hatch lid? 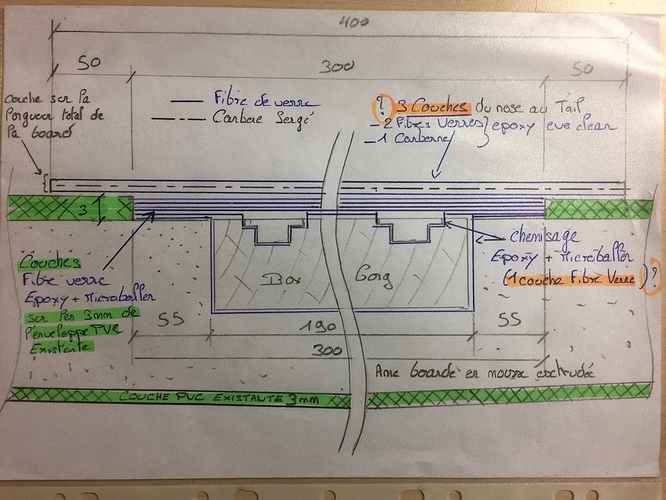 hello, the project is advancing, concerning the box for the US rails it is good to make a liner fiberglass epoxy resin micro balloon and then actually several layers of fiberglass resin on the upper part. we can not imagine the force generated by the mast at this place. Thanks Roger! Good outlook, hope it will work out nice. Yes I am, 5,5mm thickness. WIll epoxy this as well. Did you every had any issues with leaks around the holes of the plywood cover? Thanks Manu. Trying to follow your proposal. Do you mean to place the liner of fibreglass epoxy resin between the box and the foam of the board? And than additional layers on top of the box, covering the board+fin box, is that what you mean with “resin on upper part”? Thank you. I agree with you that the loads will be very high, so that why I want to make this as strong as feasible. I’ve never had more than a few drops get though. I’m still not sure if it came from my water pump or incorrect lid tension. Thanks Manu, will study this! It’s been quite for a while, but I have been working plenty of hours on the project. Especially the board, close to a never ending story of sand paper, epoxy and filler, and again and more. But the last 2 weeks the board took some shape. I epoxied my hatch frame into the board, using a mixture of epoxy and a small cotton fibres, to thicken the paste. 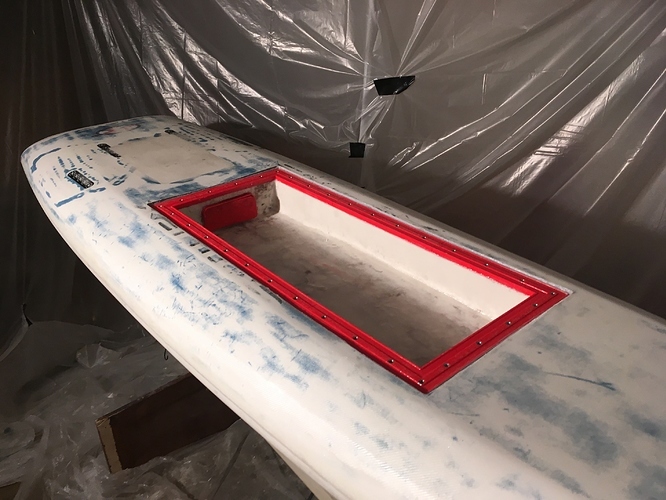 The wooden hatch was placed on top to create an even pressure on the 3d printed frame. The small gap between the frame and the board was filled with more epoxy. Really hope this is properly water tight. 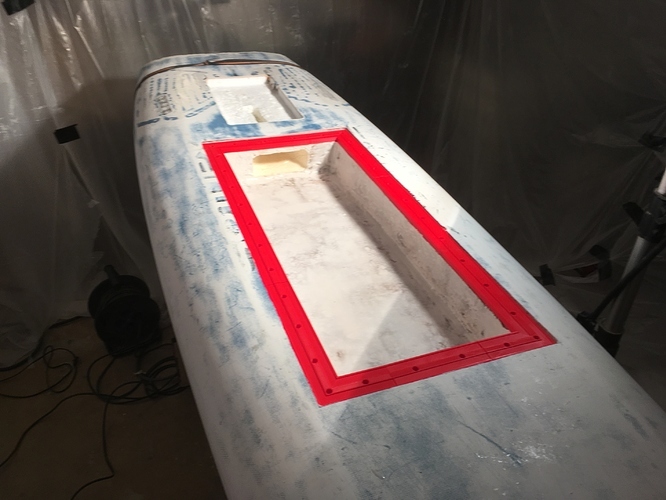 The steel counter plate with long studs fixed to the fin boxes was also installed and tightened securely. I used metal pipes around the studs between the metal plate and the fin box in order to avoid compression/denting the foam board. 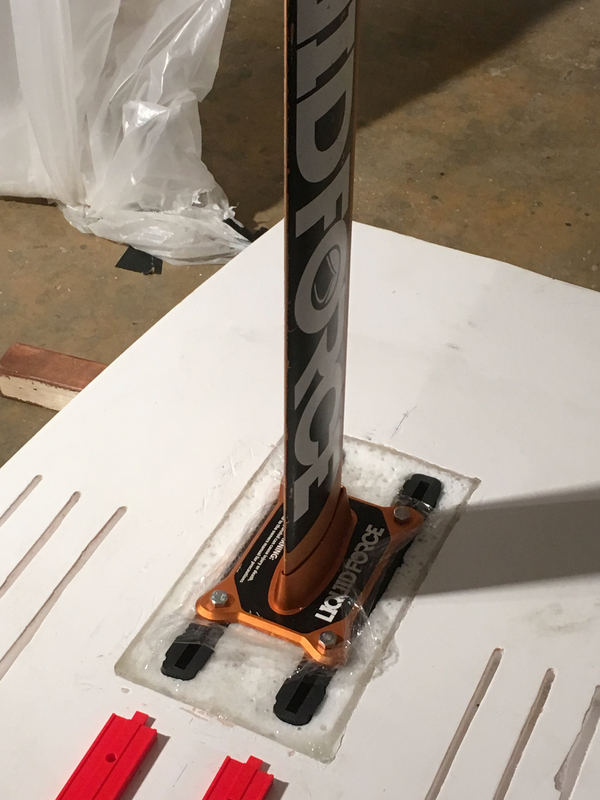 It feels quite sturdy. I used a polyurethane foam to fill the hole. So can’t access it anymore. I left the original glass fibre structure intact wherever I could, but in order to compensate for the Ebox hole I added a layer of fibre glass in the E-box and on the top+bottom of the board. Wooden strips + fibre class were epoxied into the bottom of the board earlier. Against the backside of the box you see a 3d printed plate+frame. This “collector” is where the motor wires + waterline come from the mast. The collector is epoxied for water tightness and then heavily gloed into the board, to avoid leeks. I will place the cable glands into the red cover plate once the cables are pulled and finally epoxy this into place as well. I am quite afraid that the box might not be fully water tight so I designed a polycarbonate box to go inside the box. All the electrics will be installed into the polycarbonate box and some additional cable glands will wire the cables outside this box. 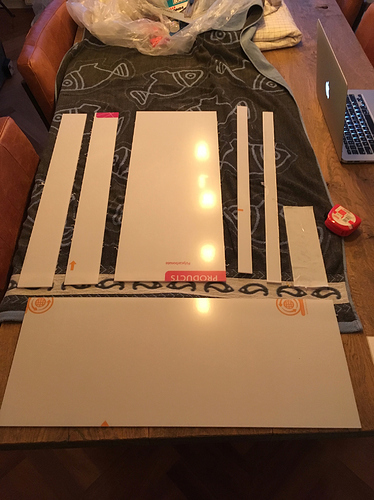 Unfortunately the company did not provide all the parts, so could only glue half the box together. But it is all slowly coming together. 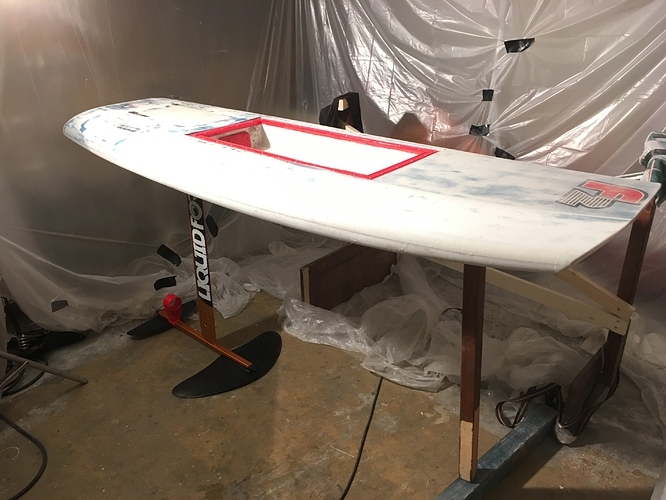 Yesterday night if secured the efoil to my custom board for the first time. It does all get quite heavy, have to check the weight, very curious. Next step is to paint the board. Unfortunately for me 1m above my head here I have neighbours, and poorly insulated floors, who complained about me painting before. So I have to make a paint booth in my guest bedroom. I soldered all the electrics together and powered the prop with 12S, feels very powerful. So soon I can assemble the motor pod and pull the wires into the board. Then finalising the poly carbonate box + some other small bits in pieces. I have almost the same shape of board. Mine is only 135cm long and 77cm wide but it works very well. My weight is 73kg. Cool, sounds promising for me. My weight is about 70 with roughly same volume of the board.